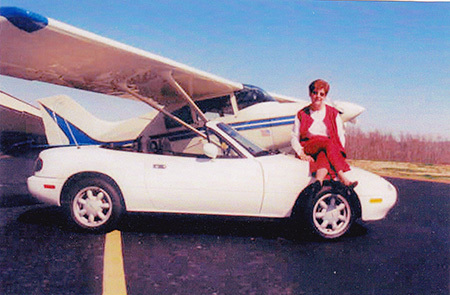 Congratulations to Lee and Shirley Dautreuil on the selection of their 1990 Miata as the December Miata of the Month! 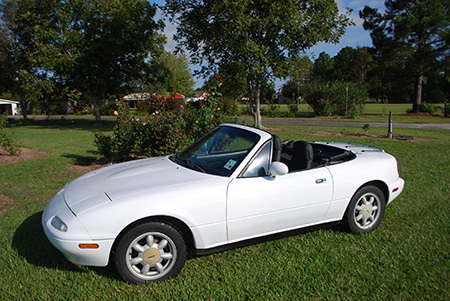 We purchased this white, standard transmission Miata for my wife for her 50th birthday in 1990, brand new. We had gone to purchase a new Buick Reatta. We arrived at the Buicked dealership. No one knew anything about the car or the price, with the owner's son just sitting there. It was about 3:30 PM. I asked my wife. What about the Miata ? She said, I like them too. We went to the Mazda dealership around the corner. The salesman was courtious and anxious to help. There was a red one with automatic and power steering. By this time it was well past 4 PM. My wife said we'll come back tomorrow, I'd like to try the white one on the show room. He said, no Ma'am, and had the other sales people help push it out. She drove it, loved it and said, we'll come back Monday and do the paper work. No, he said. The boss said take it home, we will call you when the paper work is ready. No one knew us there, he took our name and phone number. We kept calling them. For whatever reason the paper work would keep coming up missing. Finally after two months, they called for us to come in. They then wanted to know how we were going to pay. We said cash, first time they had asked. 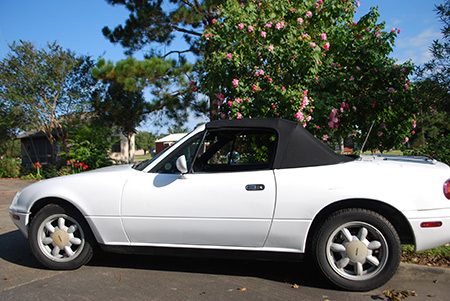 We paid $15,500 for the Miata and have been driving it since. It got a paint job a few years ago. 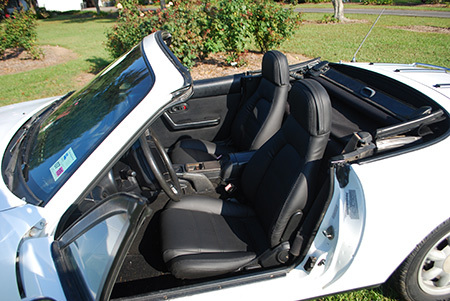 Last month we added our third top and new seat covers, plus a new radio and speakers. We replaced the clutch about six years ago. We have 152,000 miles and counting. We have traveled most of the USA, especially TN and AR in the fall with one trip to New England in the fall. We both still drive it; however, it has become mostly mine. We are both retired. I am 76 and my wife 73. We still get lots of looks, especially from kid riding in school buses when we are behind them. The children wave and mouth, I love your car. Well, we do also. It has been and still is a great automobile. Neither of us will ever sell it. and I am certain it will be a fight as to who gets it once we are gone. Then or if we are no longer able to drive. We have three grown children, 8 grown grand children and 5 great grand children aged from 12 to 5. And all love the Miata. It has always been garaged and serviced on a regular basis. Still get 30 MPG. The Miata has truly been a joy to own.